I have been canning for so long that I take for granted the fact that I am fluent in the language of canning but that others may not be so familiar with these special words. One of my students said something the other day that really opened my eyes. She told me that she bought the new Ball book and I was so happy to hear this! Her new book, however, came with a new problem and it truly made me think. The process of canning and all the unique vocabulary are very new to her. I wondered what she might think certain meant, for example: water bath canner, process time, headspace, rings, lids, nonreactive pot, sterilized, cure, brine, curd, funnel and pectin – just to name a few. If you have ever struggled to learn the vocabulary of canning, you are not alone. I, too, needed to learn a lot when I started canning. It confirmed for me that the All In A Jar canning school is much-needed. I’m happy to share what I know and I’m willing to research anything for students if I don’t have an immediate answer. Canning is surely a lost art and I want everyone to rediscover and embrace it. Happy Canning! Not sure what some words mean? Here is a list to help you remember. Chutney and Sauce…. Both of these categories are a combinations of vegetables and/ or fruits, spices and vinegar cooked for long periods to develop flavor and texture. Chutneys are highly spiced and have a sweet-sour blending of flavors. Sauces range from mild to hot. Relish ….. A condiment eaten with plain food to add flavor. Jardinière ….. A garnish of mixed vegetables. 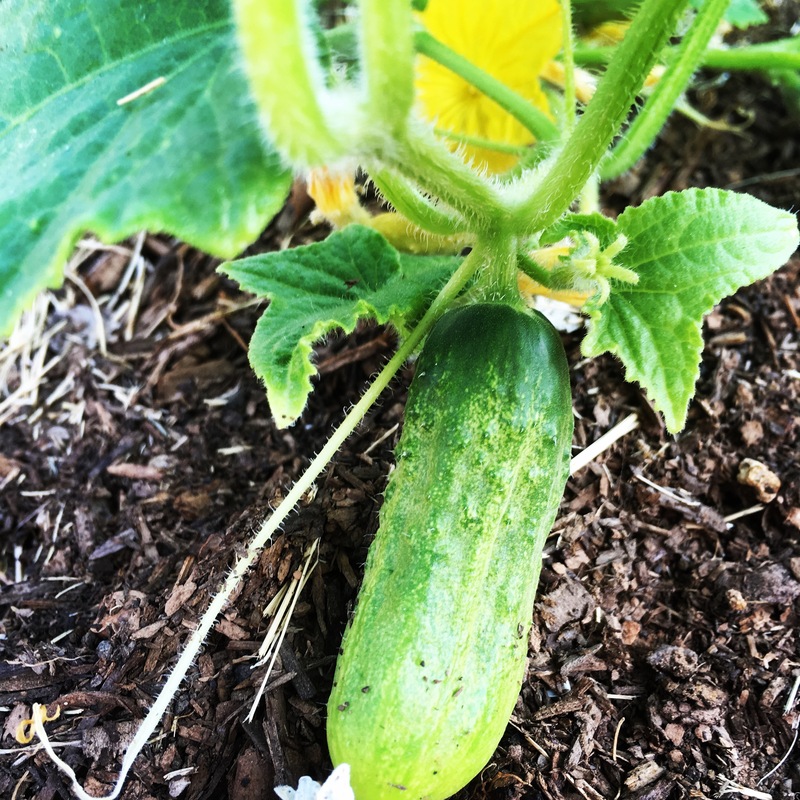 Pickled ….. Preserving in vinegar or brine. Brine ….. To soak in salty water. Butter ….. A paste of spiced stewed fruit used as a spread. Mincemeat ….. A mixture of currants, raisins, sugar, apples, candied citrus peels, spices, and suet, typically baked in pies. Conserve ….. A sweet food made by preserving fruit with sugar; jam. Chutney ….. A spicy condiment made of fruit or vegetables with vinegar, spices and sugar. Originating in India. Marmalade ….. A preserve made from citrus fruit, esp. bitter oranges, prepared like jam. Blanch ….. To loosen the skin of nuts, fruits and vegetables by dropping in boiling water. Then into ice water. Boil ….. Water or food heated to 212F at sea level. When referring to the boiling-water canner, it means a rolling boil for the entire processing time. Boiling-Water Canner ….. A kettle-pot larger enough to completely immerse and fully surround canning jars and have two inches above the top of the jar. Used to process high-acid food. Lids & Rings ….. Two piece vacuum closure for sealing jars. The set consists of a metal band and a flat lid. The lid has a flanged edge and sealing compound. Headspace ….. An area left unfilled between the top of the food and the rim of the jar. Hot Pack ….. Filling jars with precooked, hot food prior for processing. Preferred method when using firm food. This method permits a tighter pack, reduces floating and requires fewer jars. Low-Acid food ….. Foods which contain little natural acid and have a PH greater than 4.6. Bacteria thrive in low-acid foods. They can only be destroyed by heating to 240F (at or below 1,000 feet above sea level) for a specified time in a steam – pressure canner. Pectin ….. A complex colloidal substance found in ripe fruit, such as apples and citrus fruit. Pectin is available commercially in powdered and liquid form. Pectin, in the correct balance with sugar and acid, assists in forming the gel structure in jellies and soft spreads. Pressure canner ….. A heavy kettle with a lid which can be locked in place to make a steam-tight fit. The lid is fitted with a safety valve, a vent and a pressure gauge. Used for processing low-acid foods. Steam created under 10 pounds pressure at or below sea level reaches 240F which is hot enough to destroy harmful bacteria. 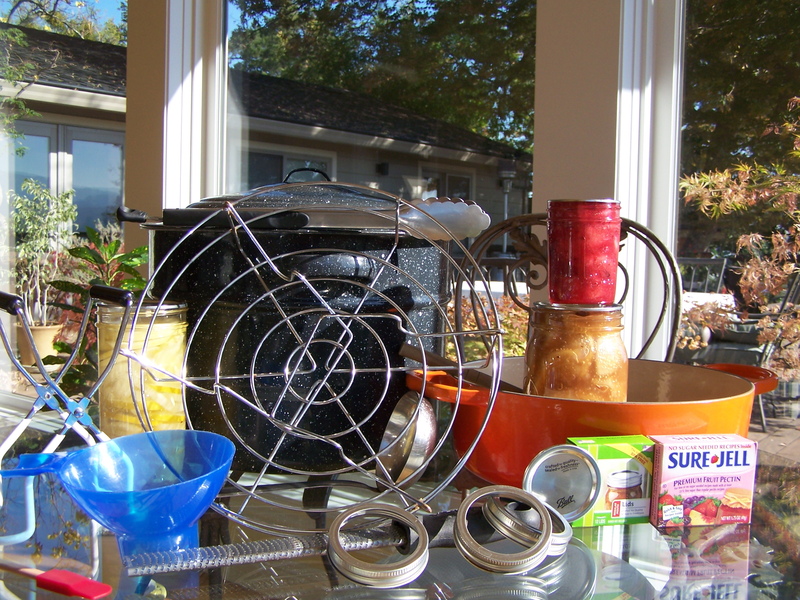 Processing ….. Sterilizing jars and the food they contain in a pressure or boiling-water canner to destroy harmful molds, yeasts, bacteria and enzymes. Raw Pack ….. 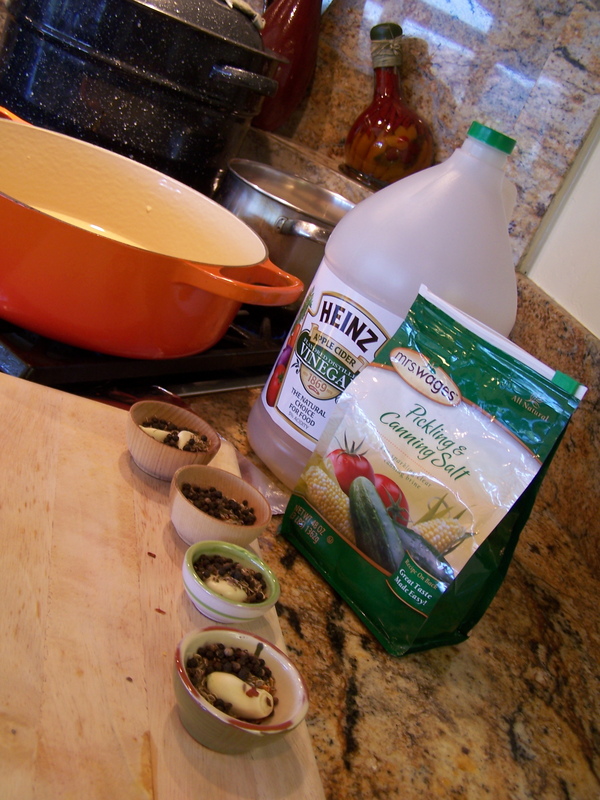 Filling jars with raw food , unheated food prior to processing. Simmer ….. To cook food gently just below the boiling point (between 180F and 200F) Bubbles will rise gently from the bottom of the pot and slightly disturb the surface of the food. Syrup ….. A mixture of water (or juice) and sugar used to add liquid to canned or frozen food. Vacuum Seal ….. When the jar is heated, the air and food inside expand, forcing air out and decreasing the inside pressure. As the jar cools and the contents shrink, a partial vacuum forms. Jar Funnel….. A plastic jar funnel having a wide opening that fits regular and wide mouth canning jars makes filling jars easy and quick. Jar Lifter….. Hot jars can be safely removed from the canner with large sure-grip tongs.